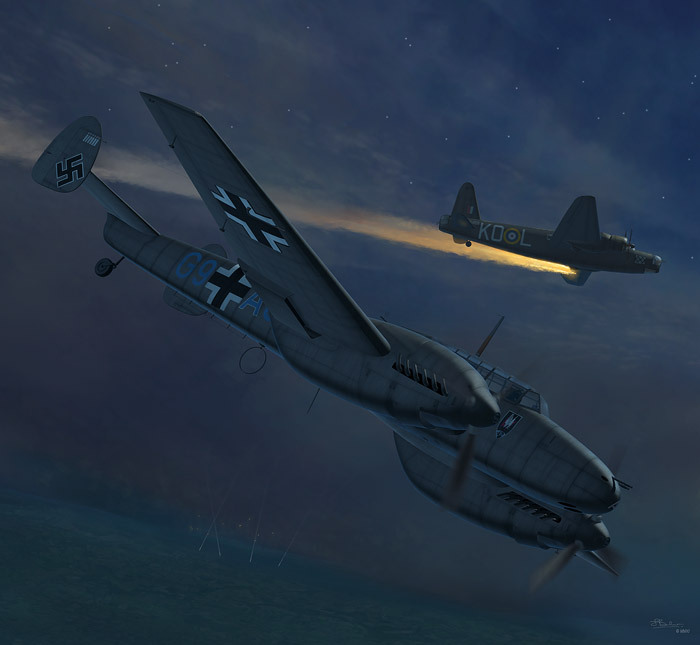 This is my artwork of the Messerschmitt Bf 110 E night fighter flown by Hptm. Walter Ehle, bringing down a 115 Sqn Wellington in the early hours of 30/6/1941. This website helped me alot with the depiction of the Wellington in the Bf110 artwork, in terms of markings details, time and place, etc. This image was created as cover artwork for a French magazine called 'Aéro-Journal', details of which can be found at http://www.aero-journal.com/ . There aren't any prints etc. for these.